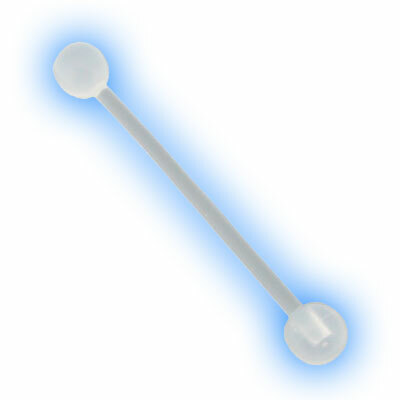 Long Clear Bioplast Barbells with Clear Acrylic Balls that are great for disguising an Industrial Ear Piercing. We often get asked how to hide a Scaffold or Industrial Ear Piercing for Work, Job Interviews or School. You can use 2 seperate short barbells which would obviously hide the piercings but ideally it is better to keep one long barbell connecting the piercings. We recommend this Long Clear Bioplast Barbell, it is 1.6mm (14 gauge) and available in lengths from 30mm through to 50mm), it is externally threaded and has Clear Acrylic Balls in either 4mm, 5mm or 6mm. Obviously it will still be visible in the ear but beacuse it is clear it will be a lot less noticable and will go a long way to disguising the piercing. Becuase there is no metal content in it at all it can also be used for Hospital Procedures suchas MRI Scans, X Rays or operations.